I used to be a major game player, board games that is. That was before I had kids. After having them it became hard to play. I'd run into them wanting to throw the pieces, fight over pieces and end up loosing pieces. I want to get into playing them again. Now they are at the age where they are better about all the above. Mica especially is fun to play with! They vary in ages, so it still can be a challenge to play. I like Rummy Cube and Scrabble. I'm good at Rummy Cube, and always loose when I play Scrabble. I still like to play because I find it challenging. Go Graham Go! is giving away 5 games on her site by Bananagram! 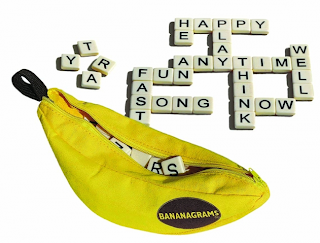 Bananagram looks a lot like Scrabble and I want to try it out! I love the look on their site as well! It's both creepy and fun! I am not much of a game player. I would rather be outside finding something to do in the fresh air. I LOVE playing games so much!!! Rummy cube is my fave! I wish we had more times for games too. Sometimes we play monopoly, life, or backgammon on our tablets! 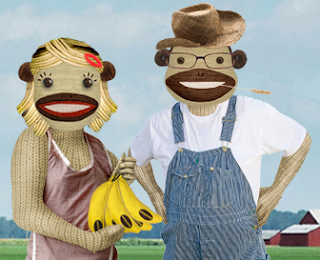 Win Big With Del Monte Fresh Produce!